At his valedictory address to the Trades Union Congress Brendan Barber used the Olympics as a proof of the way that community is stronger than markets. The fiasco of the G4S contract was spectacular evidence of the fact that in key strategic areas we cannot rely on the market: ‘Congress, it’s right to celebrate the Olympics, but it’s even more important to learn from them. For the central lessons of this summer – that private isn’t always best and the market doesn’t always deliver – surely need to shape future policy.’ Even the blogger at the Spectator had to admit that he had a point. We now have similar evidence of market failure in the area of our key strategic transport network: the railways. 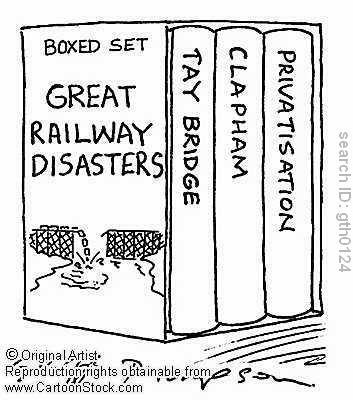 It was a whole series of fatal crashes, caused by poor safety standards and inadequate oversight by managers with no railway expertise, that led the Labour government to take the track back into public control. Now the fiasco of the West Coast mainline franchise indicates that the train services themselves cannot be effectively run in the private sector. The three franchise contests currently underway, which will now be suspended with further costs to the taxpayer, and the 15 due before the next general election threaten an omnishambles on the railway. The costs of the market obsession to the taxpayer are huge. Privatising the role of money creation has cost us the biggest bank bailout in history, caused the longest and deepest recession in the history of capitalism, and bankrupted the country. In comparison the mere £60 million we will shell out to refund the huge companies whose competitive bids could not be effectively compared seems small beer. The lesson is clear: the railway should come back under political control, as should other key strategic sectors. Who would bet against the energy sector being the next to expose the flaws in the market ideology. But other wider lessons should also be drawn. In areas of key strategic importance, or which involve high levels of risk and uncertainty, the market simply cannot function well. This current problem will be blamed on mathemetical errors by civil servants but that is simply unfair. How are we to measure the risk that the Virgin brand will become tarnished, or that the cost of fuel will increase more than anticipated. How can a contract that includes a numerical measurement of uncertain variables over a period of 15 years possibly be concocted? It is because vast and complex systems that we all rely on, whether financial or infrastructural, are so risky that accountabity for them should be political rather than financial. In such areas the market will always fail, and until this lesson is learned we will continue to pay the human and financial cost.